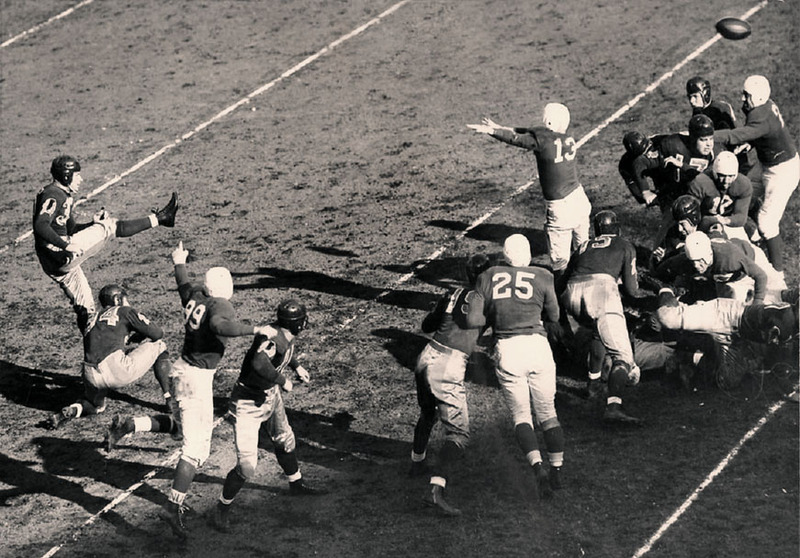 Redskins game vs. the Brooklyn Dodgers on Oct. 30, 1938. 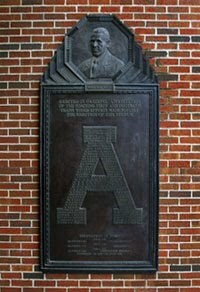 In the first NFL Draft on on Feb. 8, 1936, Alabama halfback Riley Smith was chosen second behind inaugural Heisman Trophy winner Jay Berwanger from the University of Chicago. When Berwanger chose to forgo a pro career, Smith became the first NFL player selected in the draft to play in the league. At the time, the Redskins were still located in Boston but owner George Marshall was already pondering moving the franchise due to lack of fan support. While the Harvard and Yale were packing in the crowds on Saturday the Redskins could only average 5,000 or so per contest. The situation darkened further with the arrival of the Boston Shamrocks AFL team in 1936. With Smith at quarterback, the Redskins put together the team's first winning season as well as the franchise's first Championship appearance. The Green Bay Packers' offense, fueled by Smith's former Alabama teammate, receiver Don Hutson, defeated the Redskin's 21-6 in the title game. Smith became a part of Redskins lore on Sept. 16, 1937 when he starred in the first game the team played in Washington D.C. after moving from Boston. In front of a capacity crowd of 24,492 Smith shone in the floodlights at Griffith Stadium against the New York Giants. He would score all of the Redskin's points in a 13-3 victory over the Giants; a 60-yard interception runback, two field goals and a conversion kick. "With deft toes and hands and a streaky change of pace when that need arose, the comparatively unheralded Smith projected himself full into the spotlight of last night’s scene to win the game for Washington," gushed Washington Post sportswriter Shirley Povich of the performance. Smith's starring role in the offense was already being eclipsed by the Redskins' first pick in the in 1937 draft: TCU's Sammy Baugh whose one-year $8,000 contract made him the highest paid player on the team. Yet, in 1937, the offensive punch of Smith, Baugh and receiver Wayne Milliner of Notre Dame proved to much for the opposition. The Redskins would go on to an 8-2 regular season record which earned them the NFL's Eastern Division Crown. Their reward was to face George Halas' formidable Chicago Bears at Wrigley Field in the NFL Championship game. Smith was undaunted by the Bear's reputation and guaranteed a Redskins victory. "Washington will beat the Bears and Sammy Baugh will be the man responsible." On Dec. 12, 1937 the Redskins beat the Bears 28-21 in front of a crowd of 15,870 on a bitterly cold Chicago day. The 15-degree temperatures and freezing cold ground prompted Baugh to call it "the worst game I ever played in terms of the conditions." Still, Smith proved prescient as Baugh completed 17 of 34 passes for 352 yards and three touchdowns. 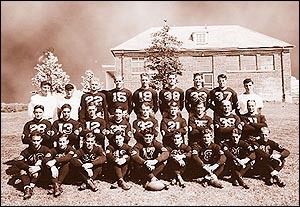 The Redskins were the 1937 NFL Champions. In his first two seasons, Smith had been a workhorse for the Redskins squad, missing only three minutes in 26 games. In 1938 he played just seven games due to injury and decided to retire from the sport saying "there just wasn't any money in it." Playing 60 minutes each week for just $250 a game, "just didn't add up." After his stint in the pros, Smith went on to coach at Washington & Lee University for several years. After serving in the Navy during World War II he returned to Alabama and went into real estate. He died in Mobile on Aug. 9, 1999.